An OEM tank manufacturer needed a unit expedited because THEIR customer was in great need of it. The vendor’s original acknowledgement date for manufacturing the gearmotor would not , however, work for the customer. Transmotion’s Inside Sales Manager, called the gearbox manufacturer rep and explained the situation. Because of Transmotion’s Inside Sales Manager’s action, the manufacturer’s rep pulled strings, and promised to make the gearmotor for TMO’s customer’s short-lead-time date. This had both Transmotion and the manufacturer’s rep working together for a happy end-user. A Paper Manufacturer customer of ours had a machine down, and contacted Transmotion (TMO) to find a specialized bearing. Because of the multiple locations in the Valued Added (VAD) family of companies (owners of TMO) we worked together and found the closest bearing to be in Sheboygan. We placed the order for an emergency pick up. The Manitowoc VAD team picked up the bearings in Sheboygan and arranged for the Paper Manufacturer to pick up with as little drive time as possible. The overall result was much less down time and a minimum amount of production time/money lost. Lesson? The VAD family of companies gives our customers a much greater “inventory” of solutions when emergencies strike. Thanks… we owe you one! Our customer–a Food Packaging Plant–needed standard bearings replaced every 30 days because of salt environment. One of Transmotion’s Customer Service Representatives recommended a plastic bearing alternative. Our customer installed a set in August of 2010 and the bearings are on their 7th month without replacements needed! With this reccomendation, the savings in maintenance time, increased productivity and parts is simply significant. A long-time customer, a food producer, used one brand of a plastic modular belt in plant. When they needed a RUSH order due to failure of that belt, “Brand A” could not supply anoter belt for the RUSH. Our sales rep – who had been working for a while to get them to to try a better belt convinced them them to substitute. Though it cost more, it would ship in short lead time. Result? The maintenance crew loved the belt. It is MUCH easier to disable and clean. In addition, the higher quality saved time, and being more durable than “Brand A” the unit would not be down nearly as often. It also saved money via less maintenance. Better belts mean happy customers! 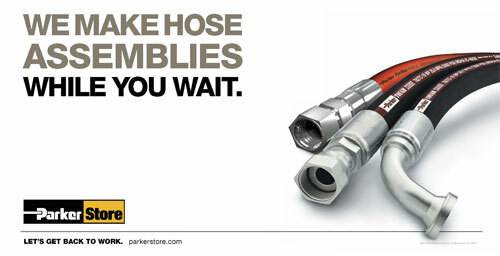 At the Parker retail store, you can come in and we will make your hydraulic fittings and hoses for you while you wait.